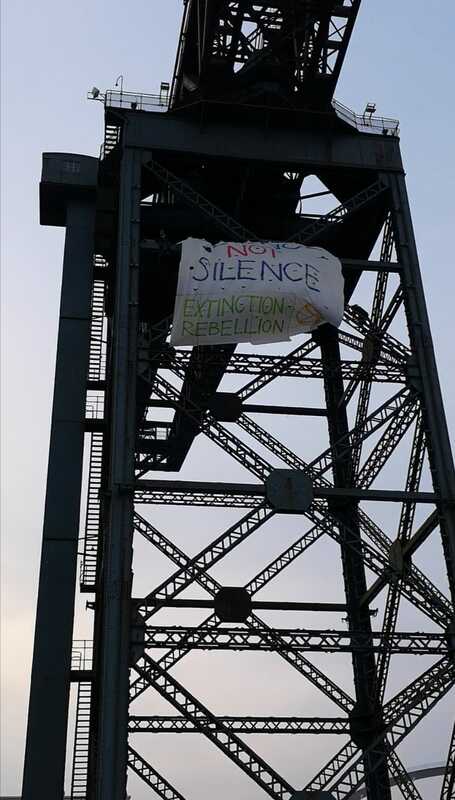 Climate activists Extinction Rebellion Glasgow dropped a huge banner from Finnieston Crane today with the message: ‘Science not silence”. The actions from Finnieston Crane and Glasgow City Chambers announce the start of International Rebellion in Scotland, with a Festival of Climate Reality taking place in Edinburgh, while roadblocks are planned for Tuesday, both organised by Extinction Rebellion Scotland. The actions are part of a huge global response. Climbers with ropes scaled the iconic structure and hung the banner, which was designed to be visible from the BBC Scotland building, to remind the BBC and the people of Glasgow that there are only 11 years left to save the world from the catastrophic impacts of climate change, according to an IPCC report in October 2018. Police officers arrived at the scene at around 7am. There were no arrests. The banner, and a series of further actions in Edinburgh, are part of a week of international protest organised by the Extinction Rebellion network to demand the declaration of a Climate Emergency by the world’s governments. Protests, including civil disobedience, are planned in 27 countries. In London, thousands gather this morning in Parliament Square, calling on the Government to reduce greenhouse gas emissions to zero by 2025 and establish a Climate Citizens Assembly to make the necessary changes to achieve this. 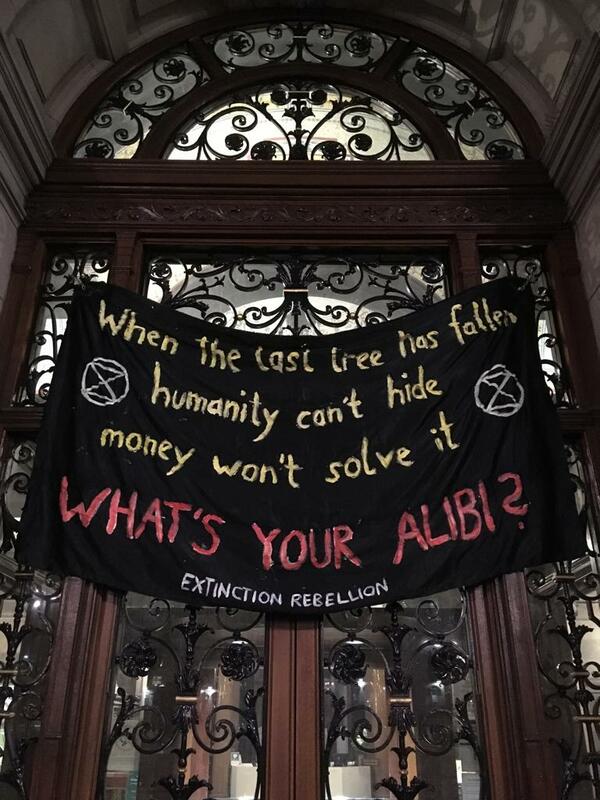 “When the last tree has fallen, Humanity can’t hide, Money won’t solve it, What’s your alibi?”.